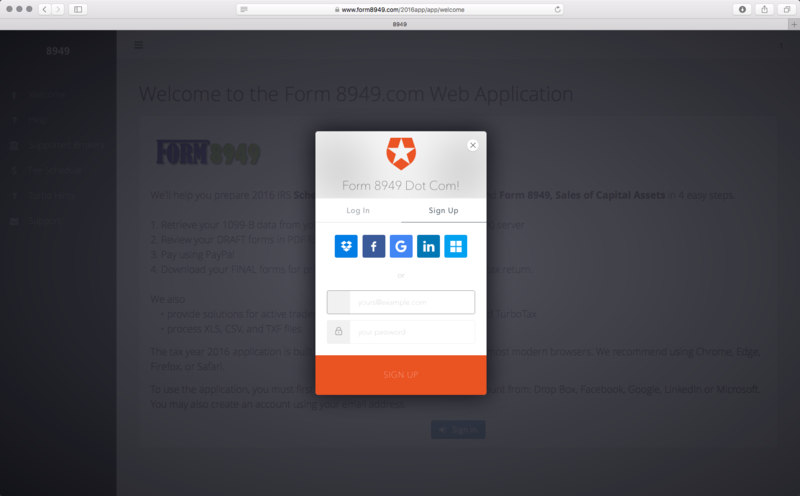 You may sign in using your account from DropBox, Facebook, Google, LinkedIn, or Microsoft. Alternatively, you may create an account by entering your email and choosing a password. Once you are signed in, the app will assign you an order number (aka file number) and passcode. To help us better serve you, we ask you to answer two questions about how you prepare your income tax return. Click on Retrieve Your Data in the side bar. Then in the Search Brokers box, enter a few letters from the name of your broker. Click the button containing the name of your broker. In order to electronically retrieve data from your broker' server it is necessary to enter the information requested. As indicated, we do not retain this information. Review the server response information. 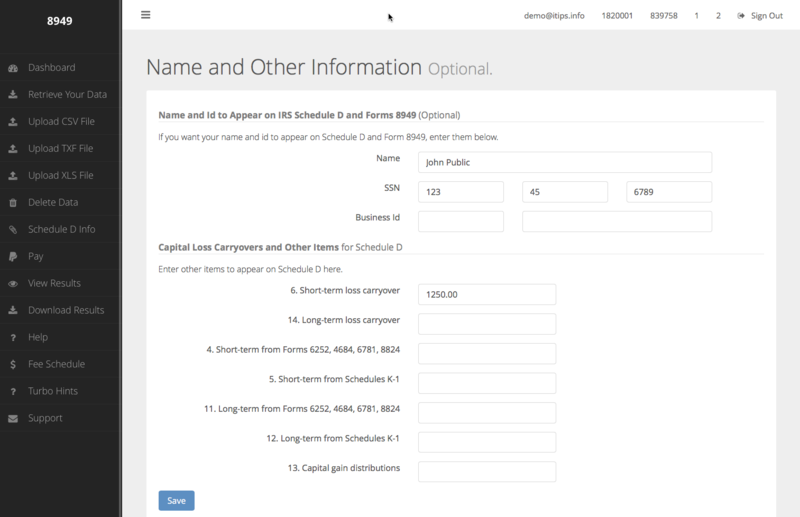 If you want your name and id to appear on your forms and schedules, Go to the Schedule D Info page and enter your info in the fields provided and click the Save button. Go to the Download Results page. Download your forms and review them for completeness and accuracy. Once your data is complete, Click on Pay in the side bar. Click on the Go To PayPal button. You can pay with your credit card or your PayPal account if you have one. After payment, return to the app and click the Refresh Payments button on the Dashboard page. After payment, you can download FINAL copies of your forms and schedules. You can also trigger an email to be sent to you to forward to your Tax Pro, if applicable. 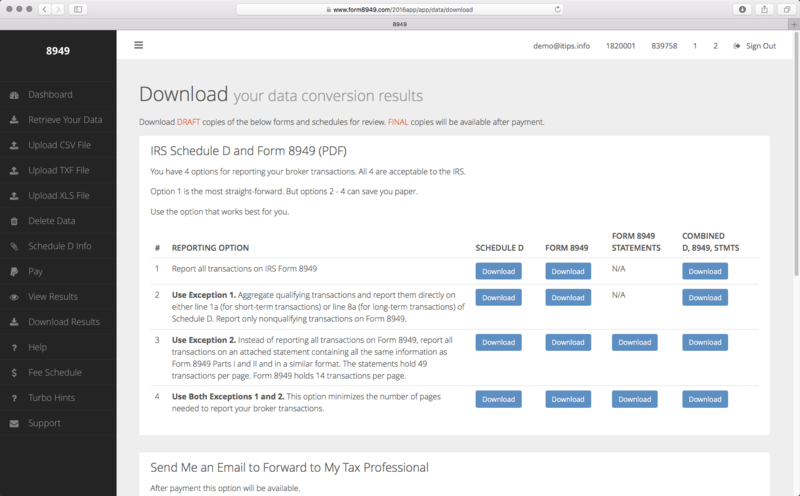 If you import into Tax Software, instructions are provided. Please email us at support@form8949.com if you have questions not answered here.